The Government of St. Kitts and Nevis is pleased with the high level of participation during the first stage of the minimum wage review process and is now awaiting submissions from partner agencies. The first consultation was held on June 5, at the conference room of the National Emergency Management Agency (NEMA) and was attended by approximately 30 representatives from the public and private sector. Government initiated the pay scale review in an attempt to ensure that workers at the lower end of the income bracket can cope with the spiraling global cost of food and oil which threatens to drive millions into poverty in countries around the world. Mrs. Browne added that while most economic partners agreed in principle with the need to raise the minimum wage, there were some who asked for time to document and submit the recommendations for review by the relevant authorities. Others called for employees to be more productive in the workplace. When the proposals are completed, representatives from government, employer agencies and worker institutions â€“ who form what is known as the tripartite group â€“ will consider the document. The permanent secretary explained that her ministry was also exploring the introduction of retirement benefits for some categories of workers which do not traditionally enjoy such. â€œ[We feel] that there is need for a pension plan to be considered for workers particularly those who are in the manufacturing sector and have worked there for several years,â€ Mrs. Browne said, adding that this will lend to a sense of dedication which will help motivate employees. A large number of residents have also joined the chorus of support for the review process which has largely been described as timely. 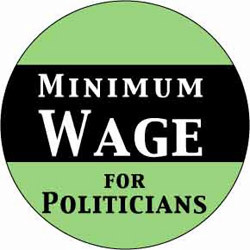 The minimum wage in St. Kitts and Nevis is EC $6.25 per hour. This is a ripoff! EC $6.25 is about US $2.35 per hour, yet people paying the smae prices for food stuff as here in america. Now wonder crime is on the creepup!